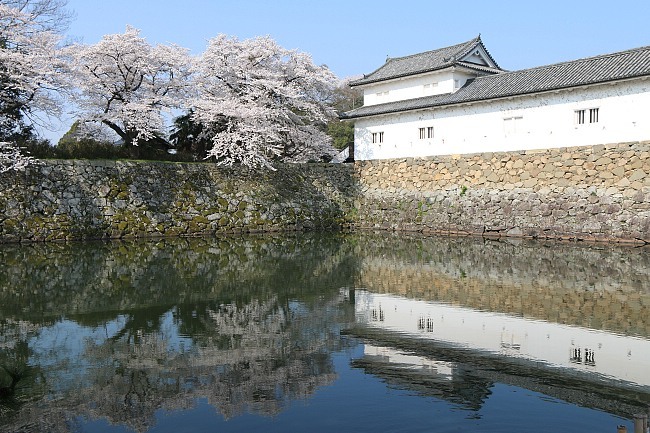 Taking a special rapid train from Kyoto would take you to Hikone in about an hour. 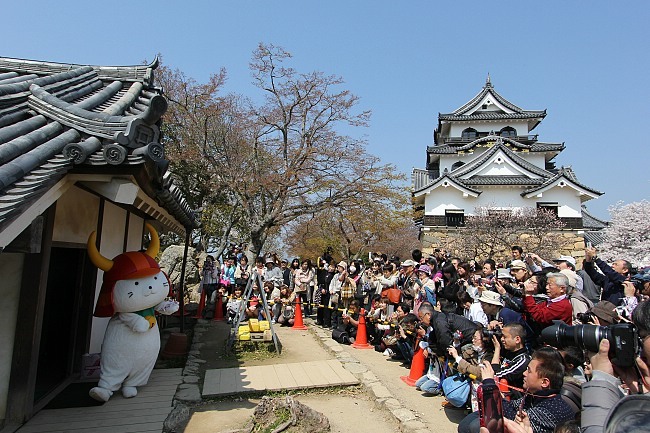 Hikone is a city on the eastern shores of Lake Biwa, the largest lake in Japan. 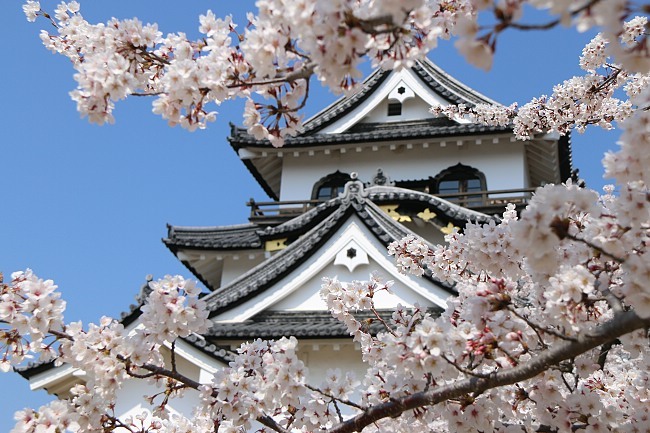 It is home to Hikone Castle, one of only four castles designated as national treasures (the other three are Himeji Castle, Matsumoto Castle, and Inuyama Castle). 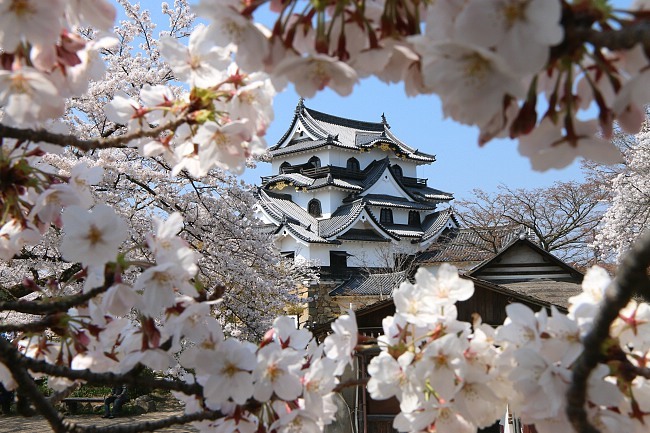 Like many other castles, Hikone Castle is a great cherry blossom viewing spot. 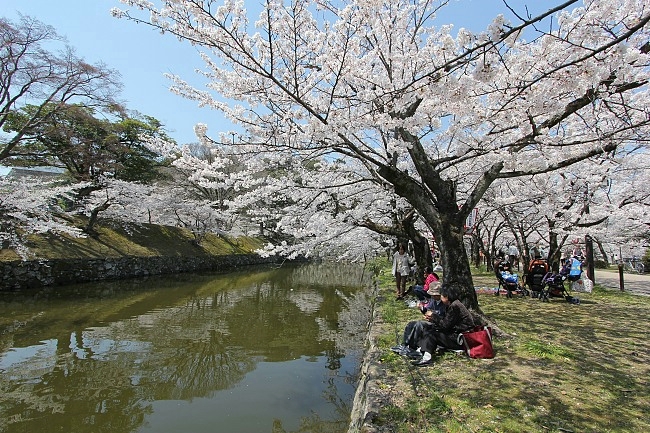 The cherry trees in Hikone tend to flower about a week later than those in Kyoto. 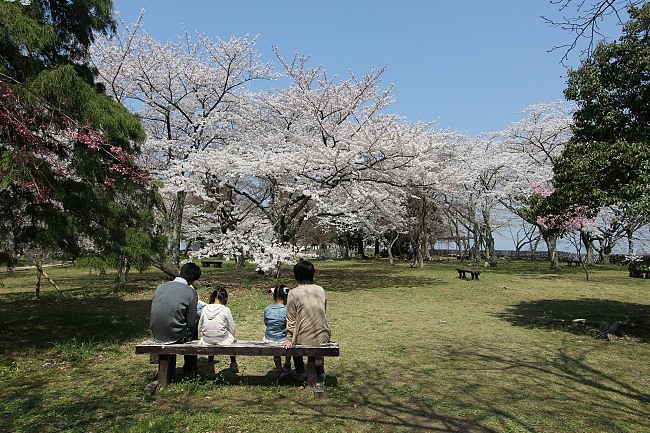 This year, the cherry blossoms started to open here on April 2, like they would on the average year. 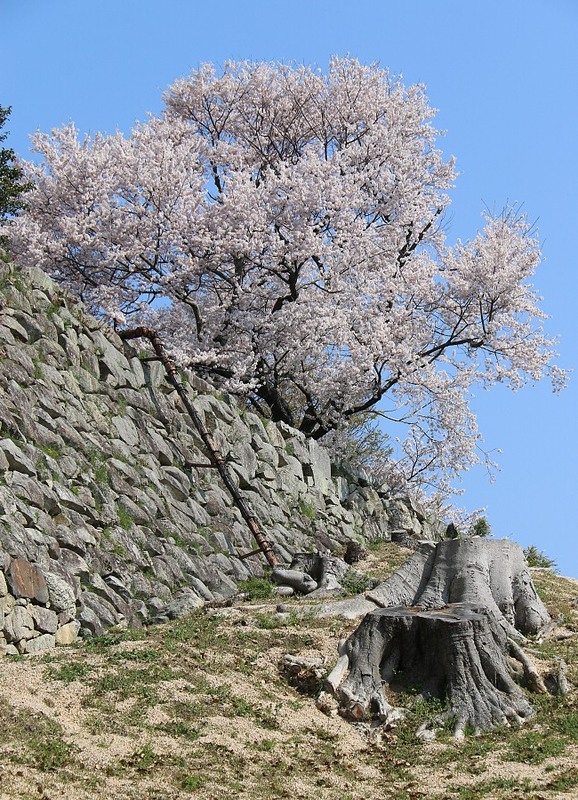 To get a feel of the progress of the cherry blossom season in Kyoto, please read my report written yesterday. 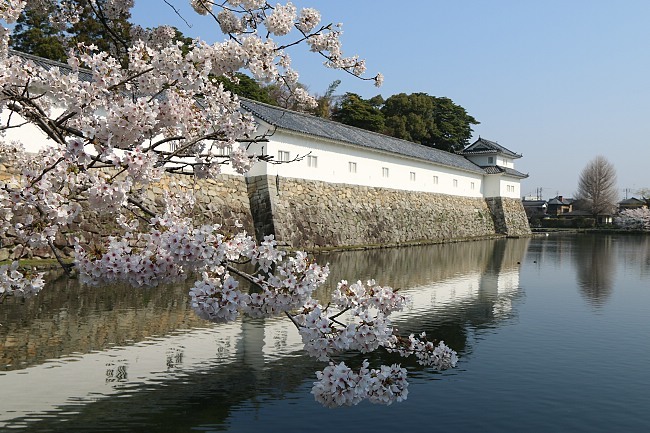 In about ten minutes on foot from Hikone Station, I arrived at the eastern moat of Hikone Castle. 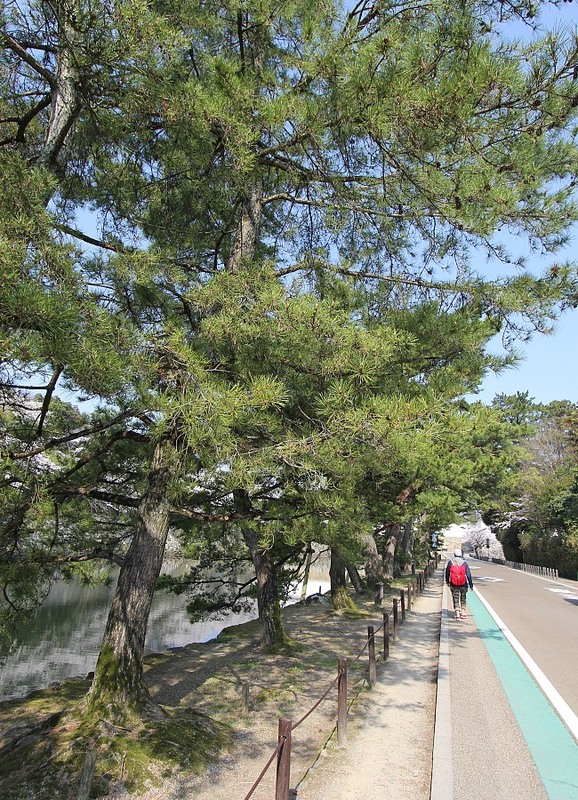 By the moat is the Irohamatsu Pine Tree Path; in the past the feudal lord used this path in his processions towards Edo (present day Tokyo); it is said that pine trees were chosen to provide shade here because their roots do not stick out of the ground and cause obstructions. Proceeding towards the inner moat took me to an L-shaped building. 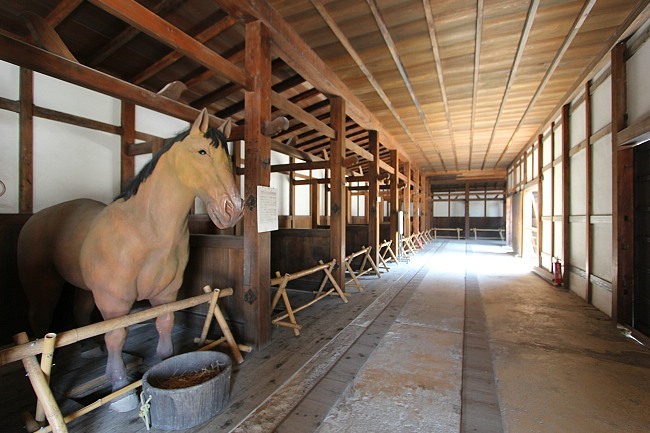 This is Japan's only extant original horse stable within a castle. The stable is open to public. After a quick visit of the stable, I started my climb towards the main keep. The approach to the hilltop castle keep was interesting. 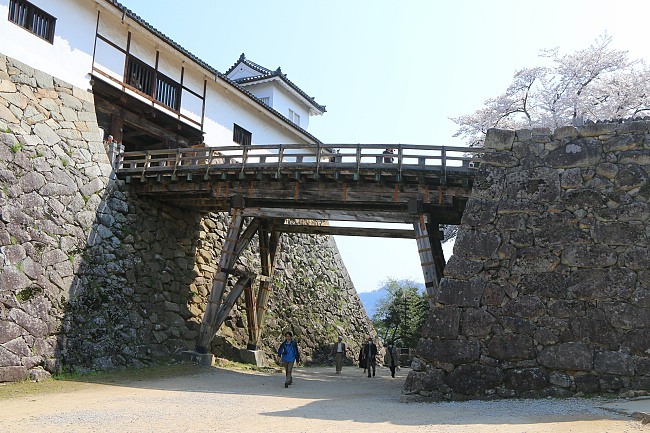 It included a spiral ramp onto a wooden bridge that can be easily destroyed in case of an enemy attack. 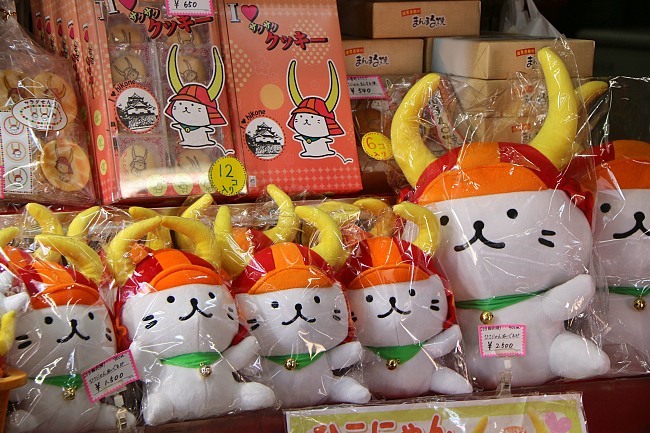 Along the way there was a shop selling merchandize of Hiko-nyan, the popular local mascot cat who dons a samurai hat. 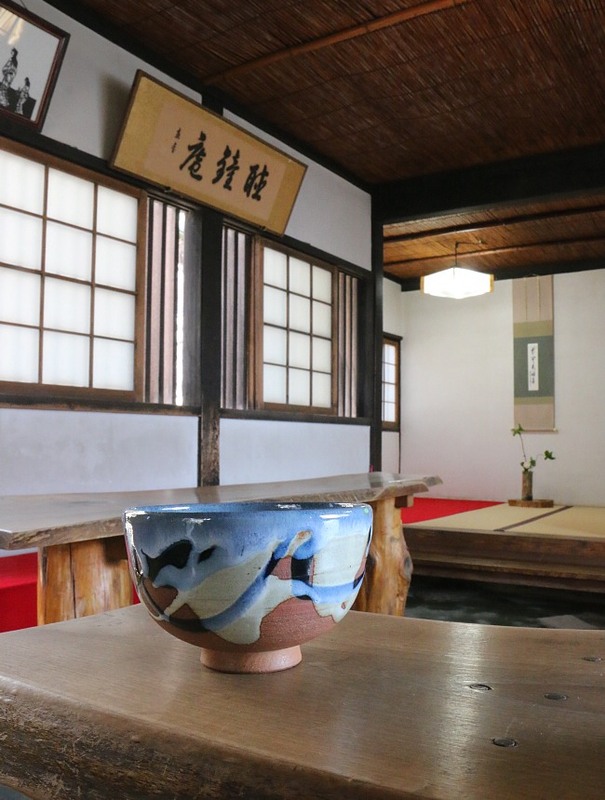 Close to the top of the hill is Choshoan Teahouse, where visitors can enjoy a cup of green tea and a snack (500 yen), before carrying on their ascent. 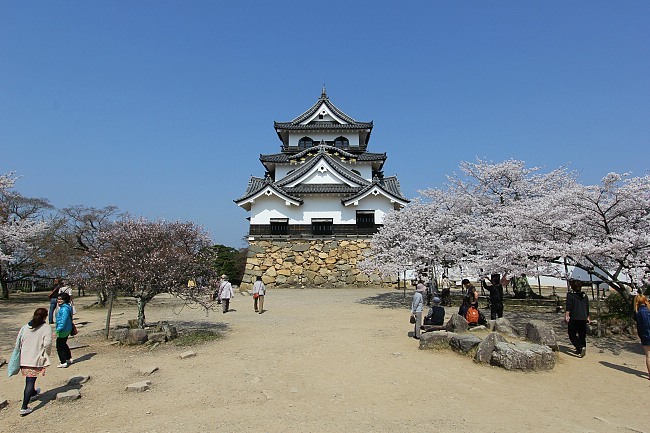 I was greeted by a lovely view of Hikone Castle's donjon as I arrived at the summit. 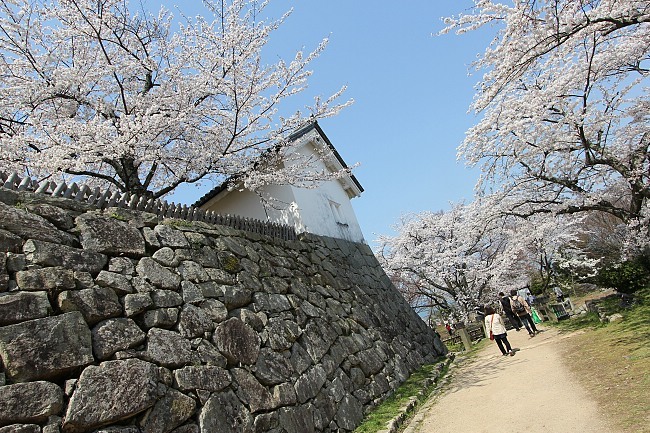 The scenery was excellent, aided by the blue skies and the cherry blossoms in full bloom. Like the other cherry trees I had seen along the way, the trees here were at their absolute best with full crowns of sakura with sturdy-looking petals. 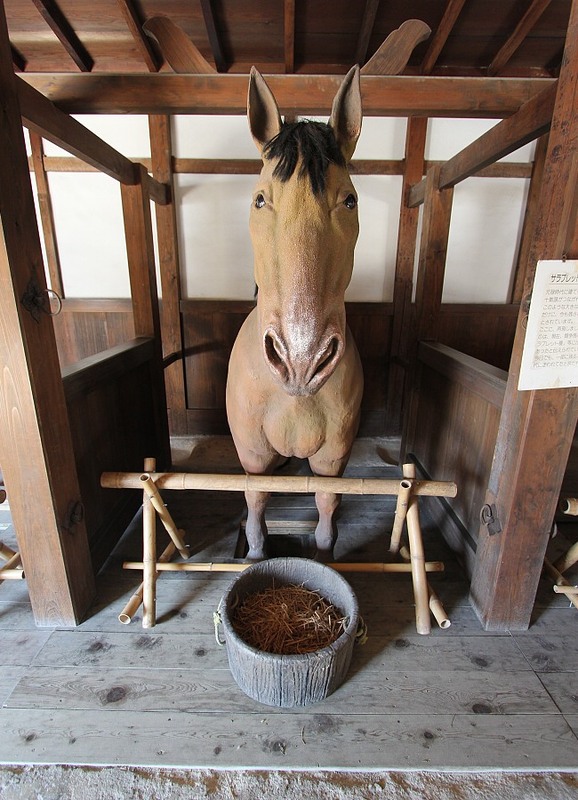 I took some time to tour the interior of the castle, and found it to be very authentic and interesting. 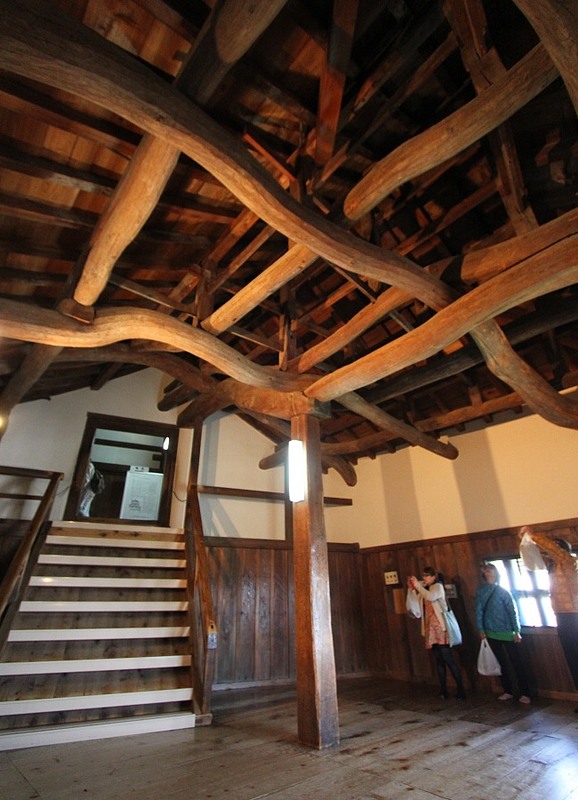 I particularly liked the curved tree trunks used as beams, which I thought were very unique. Climbing up three stories' worth of very steep stairs led me to the observation floor of the keep, from where I could see Lake Biwa in the distance. After taking more pictures of the activity taking place around the main keep, I headed west where the Nishinomaru (western circle of defence) was. The short walk took me past another grove of lovely cherry trees, under which people were sitting around and enjoying the surroundings. 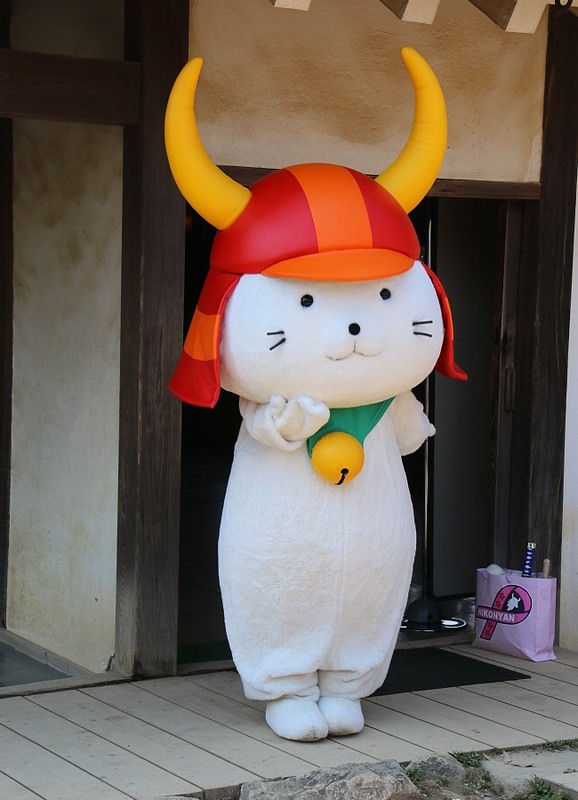 I descended the hill and exited through the Kuromon Gate, before concluding the tour with a visit to Rakurakuen and Genkyuen, two gardens located north of the main castle grounds. 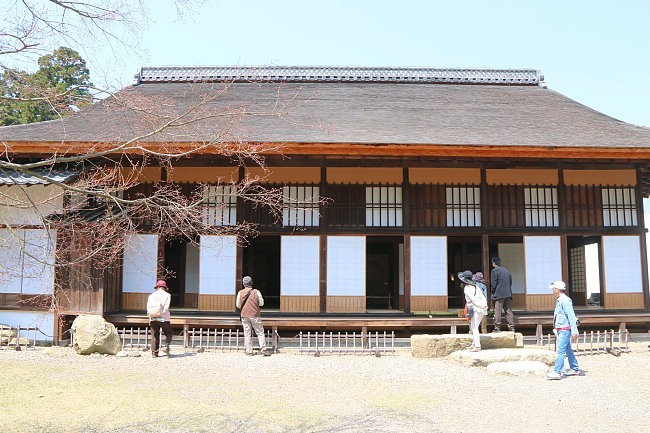 Rakurakuen was formerly called the Keyaki Goten - the Zelkova Palace in English - residence of the feudal lord in the past. Reconstruction works are currently ongoing at the former palace buildings, but visitors can view one of the buildings from the outside. Genkyuen Garden is a Japanese landscape garden with a nice central pond, built in 1677 by the lord for the entertainment of his guests and his family. It is designed after a palace garden from Tang China. 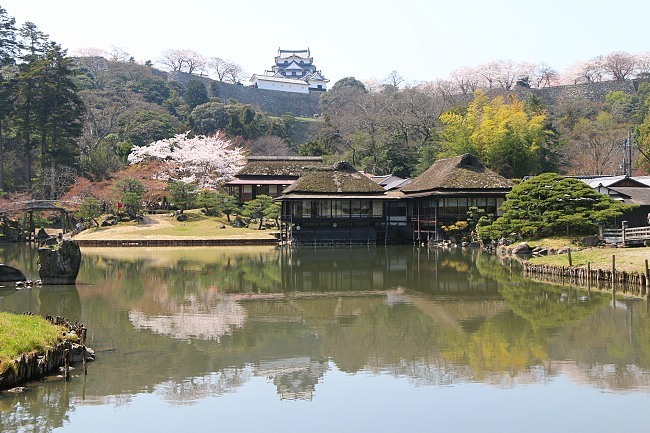 Today, I was able to catch nice views of the garden in combination with Hikone Castle and cherry trees in the background. Fine weather is predicted generally across the country for the next few days, making this period suitable for an outing. 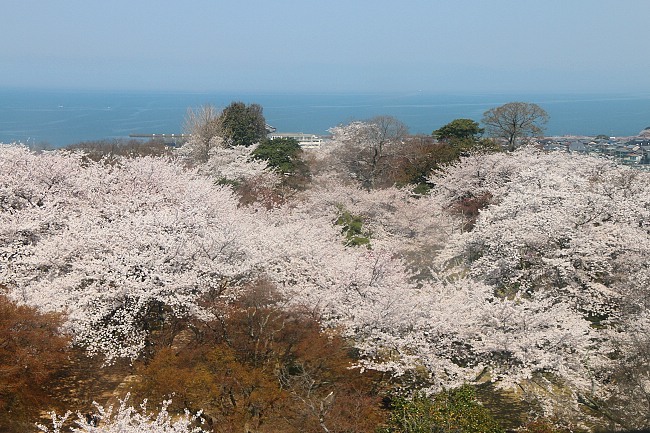 If you happen to be in the area, a visit to Hikone is absolutely recommended because great cherry blossom views can be expected through the weekend (the weather forecast as of now says it might rain on Sunday though). 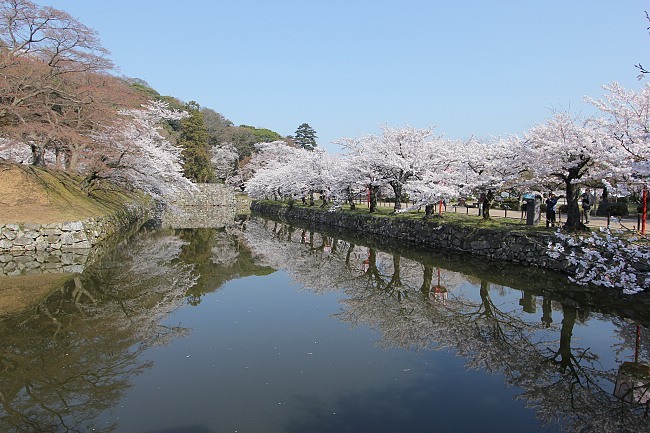 Visitors can also take a boat ride on the castle moat to view the sakura from a different perspective (45 minutes, 1500 yen during cherry blossom period, hourly departures). Illuminations will take place every night from 18:00 to 21:00 till April 20.